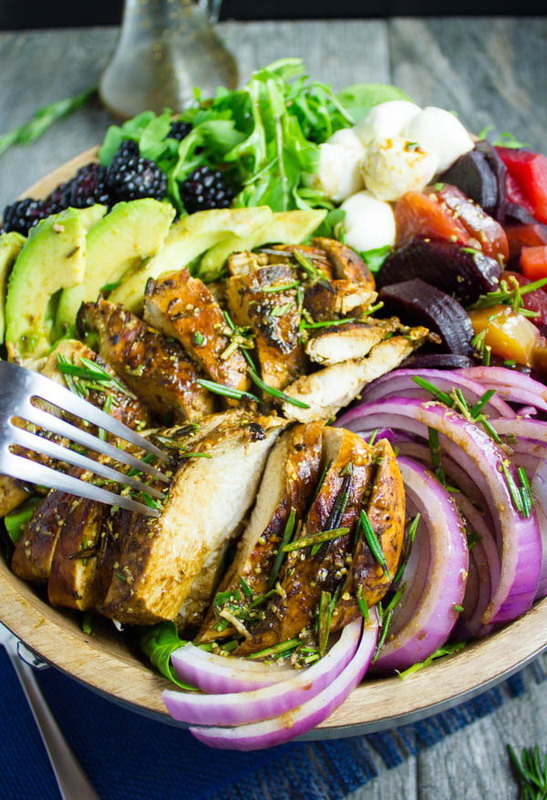 This Balsamic Chicken Salad Recipe features succulent pan-fried chicken breast in a balsamic marinade, served in a delicious colorful salad bowl, and drizzled with a rosemary blackberry balsamic dressing! There are days when you need to cook for one, cook for two or cook for a crowd. 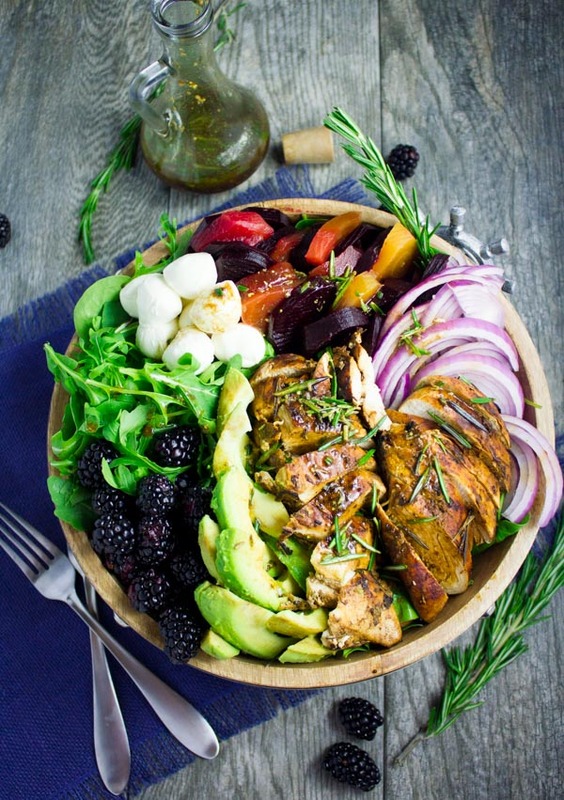 This Italian Balsamic Chicken Salad Recipe with Blackberry Dressing is a perfect match for all days. A quick gourmet salad with minimal fuss. 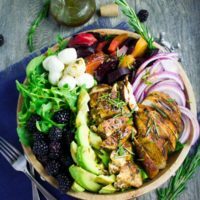 Why this Italian Balsamic Chicken Salad with Blackberry Dressing will save your weeknight dinners! Today’s balsamic chicken salad is my kind of salad. Sometimes I need that one bowl fix. Call it super food bowl, goddess bowl, or Buddha bowl (still hung up on this Lentil Fall Harvest Buddha Bowl). Whichever way you call it, it’s definitely a super delicious salad bowl. It comes running to me on days like today, kids are having a pizza party playdate and I can’t spend more than 20 mins to cook something quick for hubby and me. For days like that, I would go with either shrimp or chicken breasts. Something like this Shrimp Salad with Avocado Dressing, or today’s chicken salad recipe! Frankly, today I feel like nice warm Balsamic grilled chicken today, and since I can’t grill a whole chicken (like this Rosemary Balsamic BBQ Whole Chicken), I will happily settle for a nice chicken salad with a grilled balsamic marinated chicken breast. 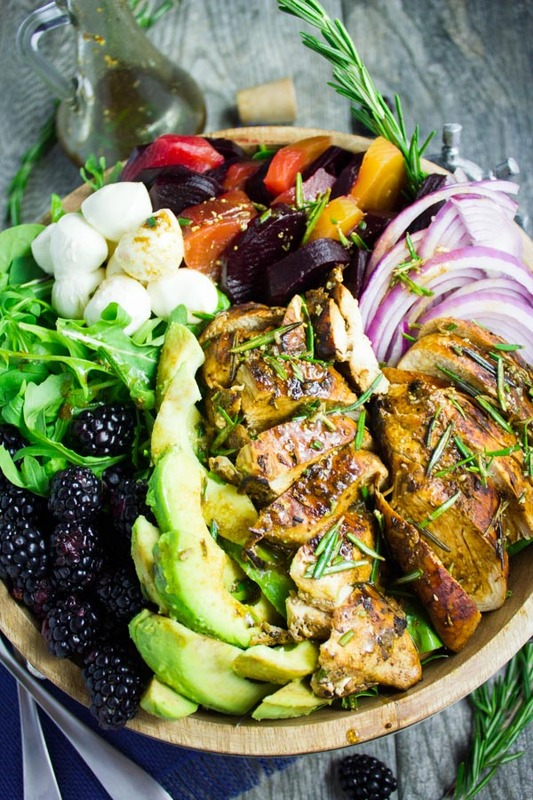 So basically this healthy Italian chicken salad bowl is all about the Balsamic vinegar – both in the balsamic marinade and the blackberry dressing. The chicken is quickly marinated in a mix of minced garlic, mustard, honey, balsamic vinegar, plenty of rosemary and that’s it. No need to let it sit for too long. Then, we pan-grill our quick balsamic marinated chicken for 10 mins, cover the whole affair with some stock to cook through for 5 mins extra and it’s ready! The salad ingredients are completely up to you. I went with my lovely arugula and spinach combo, some roasted beets, some sliced avocados, fresh blackberries, sliced onions, and some bocconcini cheese. You can add or take away any ingredients here. It’s whatever you have on hand, whatever you prefer and whatever works for your mood that day kind of thing. Then comes the sweet blackberry balsamic dressing. Any berry works beautifully here, I just happened to have plenty of blackberries because they are my little one’s favorite. So the dressing starts with finely minced shallots or red onions, finely minced blackberries, some fresh rosemary, more balsamic, honey, mustard and olive oil. 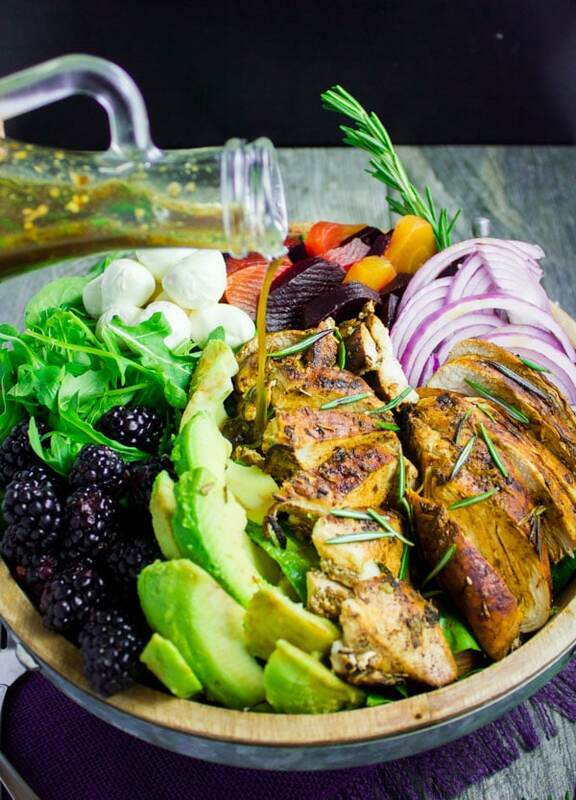 All is blended into a sweet fruity balsamic dressing that takes this healthy and protein-rich chicken salad to the next level. You can use canned or pickled beets for this recipe. Fresh raspberries work great instead of blackberries and can be swapped easily. The blackberry dressing keeps in your fridge for about a week so feel free to make plenty of it for busy days. I also love it as a dip for grilled sandwiches. Maybe this outrageously good Blue Cheese Philly Steak Sandwich? Start off with the chicken. Mix all ingredients together and preheat a grill pan on medium-high heat. Add the chicken reserving any extra balsamic mixture and grill 5 mins on each side. Then add the reserved balsamic marinade with the stock, cover the chicken and let it cook through for 5 mins on medium heat. In the meantime arrange the salad bowl. Prepare the dressing in a small food container. Add all ingredients, place the lid on and shake the container until the dressing comes together. This salad is so beautiful! I love the blackberries, cheese, and that amazing chicken. Salads like this are one of my favorite types of meals to enjoy! So true Karyl! And this salad is loaded with Balsamic everywhere! What a great dinner salad. Love all the wonderful flavours going on in this recipe. I would love this for dinner tonight. Aren’t salads for dinner the best? WOW, that salad looks so colorful and so inviting. Blackberry dressing sounds absolutely delicious – I love fruity dressings and this is the perfect recipe to try at home. Oh this salad looks beyond delicious. It’s so inviting. I love addition of blackberries and mozzarella. This is one salad I must try, like definitely. Saving this recipe. 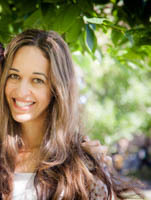 Hope you try it soon Natalie!! Don’t skimp on the blackberries!! Chicken with balsamic is always a huge hit for me. I love that you added berries too. This looks so simple and easy to make. Love the dressing too. I LOVE fruity dressings – they really bring a salad to a whole other level of delicious. This looks fantastic! We have some major fans of balsamic vinegar in this household – and the blackberry dressing sounds delicious! It’s the perfect balance of sweet and tangy and everything nice! You are a genius! This salad is needed to me. This is a really unique recipe worth trying. Is good food and this looks like one of the BEST!! Looks like you’re a salad person Dan!! All you had to say was Italian and I was all for it!! This is one delicious salad recipe. A real welcome during the holiday season, especially with all the high calorie dishes. A nice vinaigrette is all you need to dress those veggies and chicken. YUM! 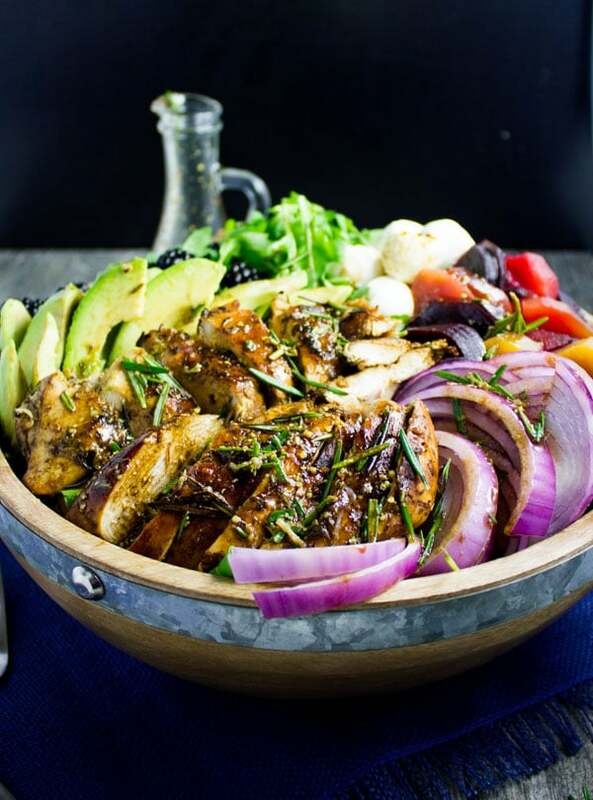 This Italian balsamic chicken salad looks delicious, perfect healthy salad for together and holiday dinners. I love balsamic vinegar which has sweetness as well as tanginess. Thanks Swatji, since you love Balsamic, you’ll really enjoy this! Thanks Tammy! this is like my go to chicken salad!